Stupidity aside, this was one of Legends of Tomorrow’s best episodes to date. That’s the way it’s supposed to be at the end of a season for any show. And yet, for a while there, this show had us doubting. Could this nonsensical group of people ever truly become a team? Would they ever win just one fight? Might we ever come to care about anyone other than Sara, Snart and — on occasion — Ray? Yes, this motley crew of misguided idiots finally won one battle (thanks to Jax, of all people). And yes, it looks like they are well on their way to finally becoming something resembling a team. But no, we can’t say we care all that much. So, count this as a win. And as a loss. Fifteen episodes later, there’s at least something to be salvaged of this merry band of idiots. I’s just not what the writers probably expected. Or wanted. It’s about fifteen episodes too late for Legends of Tomorrow to try to get all Machiavellian on us, but the effort is appreciated nonetheless. It would, of course, have been much better if they’d taken the time to drop hints about this possibility during the course of the show, but the whole “the end justifies the means” theme that the Time Masters have got going on is better than no explanation at all. And, of course, it also ties nicely into what I now get is supposed to be the whole theme of this show: choice vs. destiny. And I say that I get it not because Ray has been talking about this subject non-stop for the last few episodes, but because, at last, the show managed to get a message across without beating us to death with it. Carter. Kendra. Savage. They’re all trapped by destiny; and in a way, our heroes have been, too. But the thing is that destiny can look like free will sometimes. It’s not that Carter and Kendra chose to die all those times; it’s that they didn’t realize they were part of a never-ending circle. The same goes for our heroes. They’ve been chasing their own tails all this time without realizing what they were doing. But, now, with the oculus destroyed, destiny is no longer a fixed point in the future. Choice is, once again, possible. Does that mean they can all break free of expectations? Mick already did it. So did Snart, in a way. Now it’s time for the rest of the team to get on with the program. Leonard Snart was one of the best, if not the best character on Legends of Tomorrow. It wasn’t because he was always a good guy, or because he was perfect. No, it was because he was flawed. Because he was a hero who never dreamed of being one, because he was a thief with a heart, because he was a man who might have had a future with Sara Lance; because he was a brother, a friend. And now it’s all been ripped away. Snart is gone. Or is he? Logic indicates that on a show like this, anything can happen. The news out of the Wentworth Miller camp seems to indicate he’ll be back in some capacity, though not as a series regular. And even though we can rejoice about that, we can’t help but feel a bit cheated. Captain Canary was clearly not the long-term plan for Legends of Tomorrow. Neither was Atomic Hawk, for that matter. And yet only one of those two relationships worked. Sara and Snart were believable as friends, and we could have embarked on this journey with them and never looked back. And now, even that is left in a state of flux. At the very least, though, we’ll always have that kiss. We’ll always have the confirmation that they both cared. We’ll always have Sara’s tears. And we’ll have Wentworth Miller’s campy, over-the-top and altogether wonderful performance. May the TV gods grant us more than a few short appearances next season. Maybe there’s still hope. Not just for Snart, but for Captain Canary. Maybe that “maybe” is better than nothing. CAN SOMEONE MANAGE TO KILL SAVAGE THIS TIME? PLEASE? With just one episode left in this season of low-lows (the Old West episode) and some very few highs, let’s just hope someone takes care of Vandal Savage next episode. The only reason I’m still here it’s because of that promise. The mere thought of having to put up with this stupidity for one more season makes me want to bail. So please, Legends of Tomorrow — take care of Savage FOR GOOD. Also, let Sara find out about Laurel. Give her time and space to grieve. Reunite her with her family, even if it’s just for a short while. Finally, get rid of Carter and Kendra. I’m not saying kill them (though, hey, if someone has to die...), but I am saying don’t bring them back. They add nothing to the team. And if Savage is gone, they’re not really needed anyway. Kill Savage and let them go live a happy life together. That would be a fitting end after so many years of sorrow. Last week I ranked them on stupidity, but this week I’m ranking them on our level of investment. Because some of these people we care for, and some we just want to go away. Fast. 1. Sara Lance: We’ve loved Sara for a while. Legends of Tomorrow hasn’t changed this. If anything, it’s made us love this wounded, beautiful, fierce woman even more. Because now, we finally get a show that focuses on her and her journey. 2. 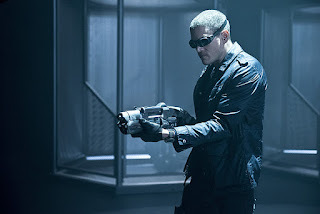 Leonard Snart: The charismatic thief was a fan favorite before his time on this show. And yet, did we ever think we’d see him become a true hero? Or that we’d be on the verge of tears at the thought of him leaving? The answer is surely no. 3. Ray Palmer: I almost dropped him down to number four based on last week’s shenanigans alone. But then he went all “hope speech” on us, and convinced me again. Every team needs a Ray Palmer, and it’s not just because he’s smart or pretty. 4. Mick Rory: The former villains win the day! It was hard going at first with Mick, but in between smacking Ray and so awesomely resisting conditioning, Mick went up a few (see: many) spots. 5. Rip Hunter: I hate him, like, 99% of the time, but I assume that’s better than apathy. I mean, at least he makes me feel something. 6. Firestorm: Jax gave me feels a few episodes ago, but Stein has been a shadow of his The Flash self and I just don’t care much if they’re on the show or not. And that’s never a good thing. 7. Kendra Saunders: The only reason she’s not at the bottom of the list is because Carter exists. I have no feelings for Kendra, either good or bad. She just bores me. She’s the equivalent of an Arrow flashback — there, but kinda not, and I just don’t pay attention when she’s on. 8. Carter Hall: Oh, Carter. You had such promise and... no, wait, no. I never cared for you. Not one bit. It’s good to know some things don’t change. If they’d done a better job of setting up these characters, we wouldn’t NEED a flashback to explain how this team got together in the first place. Why the bad guys need to explain their motivations to the heroes I will never, ever understand. “Face the facts, Raymond.” Okay, but when has he EVER done that? If the oculus can’t really control the actions of our merry band of idiots while they’re in the Vanishing Point, how did it know they were going to try to destroy it? That makes no sense. Or, maybe it would make sense, with a proper explanation. But Legends of Tomorrow is very bad at giving those to us. Ray can’t convince me that he doesn’t watch his diet. Not just because he looks like he works out twice a day, but because he ate that cupcake like someone who’s never eaten a cupcake before. I’m pretty sure Brandon Routh would look good even with a shaved head. Apparently, even I can run out of snark. Shocking, I know! Just know that I will miss you, Leonard Snart. So with season two already confirmed, I have to wonder: is this show still planning to go the White Atom route? Kendra and Carter are a non-entity, Kendra and Ray are kaput, and Snart is not coming back as a regular, so we need a ship we can root for. Was this the plan all along? Arguably, the finale could have been Captain Cold and Sarah Lance stealing the Wave Rider after parking it in Savage's dead body, and season 2 would have been something I would have looked forward to. Not this. Constantly, this show has teased potential and squandered it. Losing Miller is just next on the long, slow collapse into disappointment. I think the Time Masters knew he was going to destroy it after they told Rip about it. So I believed that is taking precautions, also if you don't like Hawks I might have some bad news. Carta and Kendra may have to stay for Season 2 now that they named droped the Thanagarians. The Thanagarians are Hawk people in the comics and in Justice League tv series they managed to adapt them and connnect it with the Ancient Egypt origin. So Carter and Kendra may have to stay. Though trust me this whole Hawk mess got a better shake in the Justice League show. You don't even see Hawkman till like late in Season 4, HawkLantern for the win. Also I don't think White Atom is part of the plan maybe there is no ship we can root for. Except the Waverider because that ship is awesome.